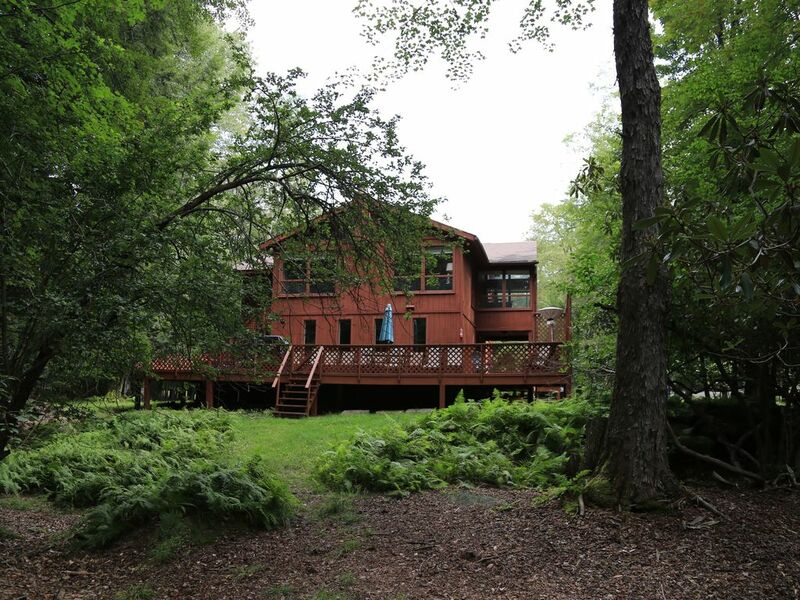 Come enjoy our beautiful spacious modern 6 Bedroom, 3 Full Bathrooms River front Pocono home. The House sits 2200 ft. above sea level on top of mount Pocono. The Lehigh River runs in the backyard and it offers magnificent views, tranquil sounds and a very relaxing atmosphere day and night all year round. You can relax by the river or go trout fishing. At night you can sit on the huge 2 level wrap around deck listening to the sound of the running water while talking, laughing and watching the spectacular view of the stars. The house offers lots of FUN for everyone. Your vacation home is located 20-30 mins away from FOUR major ski resorts in the Poconos. Jack frost, Boulder Creek, Elk mountain and Camel back.You can drive to Mount Airy casino (20 mins) or to The Mohegan Sun (35 mins) or go shopping at the crossings outlets (20 mins) . Horseback riding, white water rafting, hiking, Museums, historic sites and lots of adventures are all around the corner from where you are. If you don’t feel like leaving the resort you can enjoy a day on the beach swimming in one of the 3 lakes Big Bass Resort has to offer. OR go tan by the pool and grab a sandwich or a pizza from the clubhouse when it’s time to eat. The kids can also enjoy the clubhouse activities where they have an Arcade room, ping pong tables, pool tables and game boards. The playground also offers swings and slides that no kid can resist. In the afternoon everyone can get together for a basketball, volleyball or a tennis game. Sporting equipment can be borrowed from the clubhouse for free with your badge. At the end of the day you will go back to your beautiful, very comfortable house to continue the fun, sleep or just sit and relax. Book this house...You will not be disappointed. We appreciate our guests and strive to make your experience memorable, fun, beautiful and comfortable. Sauna is in the clubhouse. Our family had a wonderful week here. The house was spacious with plenty of room for everyone to relax and enjoy their surroundings. Thank you Yasser, again for the use of your home. Thank you. It was my pleasure hosting you and your family. The house is suited for the number of people it sleeps in outdoor space and indoor space. However, the condition of the house, the furniture, the accessories are poor. I followed up with the owner about several issue we found upon our arrival, including broken bottles on the deck and extensive mold in the first floor shower. While he was responsive to the email and the many, many issues with the house, he tried to put a broken screen door on our group after I informed him of the incredible amount of damage the house had when we arrived! If you have higher standards than a frat house for your place to stay, I would look elsewhere. We spent the weekend with friends at the house and had a blast. It’s spacy, had everything clean and my kids loved the bank beds. Also the location is great and Yasser was very pleasent and kind. Highly recommend staying there! Thank you Ricki. It was my absolute pleasure hosting you and your family. Very spacious!! All of the bedrooms were large. There is a large family/game room downstairs, and a large living room upstairs. We took our family of 12 adults plus a few tykes for a weekend getaway, and did not feel cramped at all! We spent time down at the river, went to the pool, enjoyed the hot tub, and had a family pool tournament! Very enjoyable time! Yasser was a great host. His home is very spacious and lovely, great for a getaway! Big Bass Lake is a secure prestigious gated community 5 mins. off of RT 380. The community offers 3 large lakes with two beaches, a large outdoor swimming pool, heated indoor swimming pool & sauna, baby pool, tennis courts, basketball courts, Volleyball, playground and ski slopes. The community also offers 2 club houses with so many activities for everyone all year round including ping pong, pool, arcades, shuffleboard tables, coffee shop and a snack bar. You can get all the sports equipment you need for free with your badge from the clubhouse. The badges are $4/day or $20/week. Boat rentals are available on the lakes $7 for the 1st hour and $3 each additional hour.